← Well Said via Well Dressed. Highly recommended and Mrs. E. approved. A bargain at USD$30. Find your size here. 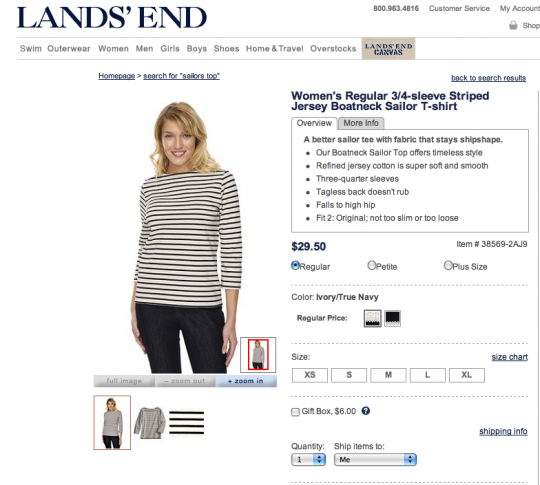 This entry was posted in Elegantology and tagged elegantlology, Land's End, marinière, Sailor t-shirt. Bookmark the permalink. Great classic, I will just sail on over to check it out. Thanks for the tip. Love Striped Blue & White! Lynn Truss may complain that they put the apostrophe in the wrong place, but their products are excellent in both design and quality. Mrs RopeySoles has been a regular customer for more than two decades. Love this style top – very classic. FYI, today Lands End is running 25% off and free shipping so I was able to purchase one for $24! Hello – I’m late to this post, but if you like striped shirts – check out these photos on wearing your striped shirt chic-ly.